No. They can be fixed to make it fair. I felt his response to Hazarath deserved more exposure because it was placed at the very bottom of a thread and then I new-paged Hazarath's thread. OK so since the original post mentions TF2 and really it seems to be the only game that has harmonious turret ballance we will use that for this argument. In TF2 the Engi class has 4 things he can build, an amo dispenser, a telporter entrance and exit and the turret. The engi starts out with 200 Metal. Each piece takes a set amount metal to build and an additional set amount to upgrade to level 2 and eventually level 3. The level 1 turret in TF2 requires 125 metal to build and is quite weak hp and damage wise. Then an additional 200 metal per upgrade. So unless you build a dispenser first or are playing a multi spawn mode or pick up ammo boxes you will not be able to get the turret above lvl1. Also in TF2 a lvl1 turret can be killed in a single shot from a full charged sniper round and goes down very fast from pretty much everything. It is not heavy damaging and dosnt have a high ROF. Now the other posters do bring up a very important detail. If you make a turret harder to kill it becomes more and more unbalanced in single spawn modes. So this is my solution to the problem. We obviously can't use the "metal" system of TF2, to much work and knowing nexon a way to exploit it, also it is only a matter of time before specs get Ammo kits to go with their HP. So my suggestion is turn to something we already have in the game. The air-strike designator cool down. How it works is simple, when you lay the turret down it starts at lvl1 and initiates a 60 second "cool down". When this cool down period is over the spec may then return to his turret and activate level 2 upgrad and then another 60seconds later level 3. A whole minute in a single spawn mode is a long time (1/3 the round of an SND round?). Yet not that long in terms of Elim,SnS and CTF. The main key for this to work is two more models for the auto turret would need to be added, the auto turret itself would need to be made larger, and given a real aim animation, not this snap to the player and also no more than a 180* arch. If done properly turrets can be great and fun weapons and great additions to strategies. They are not properly done right now. PS: Auto Turrets are no perm removed so dont freak out people. There is just a bug and Nexon is fixing it. If you read the notice fully it states that all users will be compensated for the time lost. 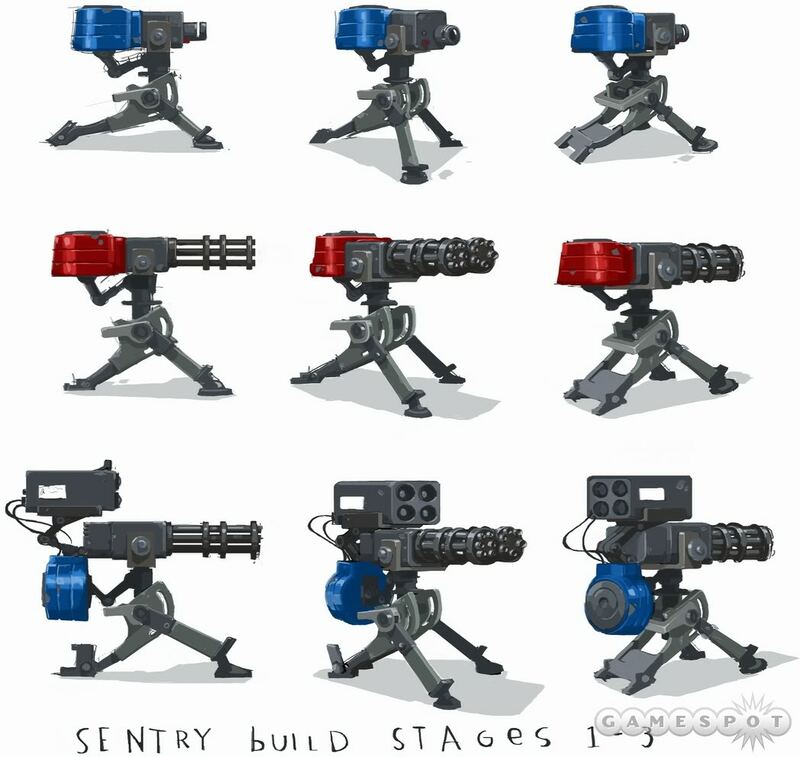 For those who dont know what the TF2 turret looks like this is stage 1,2,3 from top to bottom. ^THIS IS WHAT THE THREAD IS WORKING ON NOW. You guys figure out the dmg and health and any add-ons they get. I do agree that adding rockets for stage three would be over kill at their full dmg. would have to be 20dmg rockets if it has 4 to prevent an instant kill. You guys have a platform to work with now that extermists on both sides seem to able to live with so you guys go rip each other apart on the rest of the solutions. Side-Note: You cant up it to any higher than 60seconds though, that would just be too much of a handicap for the turret, if anything you may want to look at a lower cooldown. We CAN'T ignore this, because if Jarfer succeeds, that's that. I'm in school, so I can't post in the Nexon forums. Anyway, I think they can be fixed to make it fair. Either use Auto-turrets as an early warning device, or a short range high powered weapon. It detects people from very far away and the damage + Rate of fire + HP makes it as good as having an 8th man on your team. or make it such that auto-turrets have a very very tiny range, something slightly larger than Hornets but make them a swift 3 second kill. I have always been one for skill. Planting a turret that does the work for you is not skill. I don't like the idea of turrets 'growing'. It's an FPS, not an MMO. Now look at my suggestion. Btw I agree with Zelmarked, turrets require no skill. Some even glitch their turrets..
That's a much simpler alternative. It would make the turrets less versatile and a little less noob. Just remove auto-turrets from the game. better idea, created by enalis. Although turrets do "grow", they'll be EXTREMELY weak for the first stage. I like it. Except for the 3rd stage shooting rockets... maybe a shotgun mounted on top instead? lol I a shotgun would murder me. I fare better against dodging bullets than a shotgun shell. Have you seen enalis' suggestion? First stage is a single barrel turret. Second is a double minigun. Third is a double minigun with 2 'friggen rocket launchers on it. I would take a shotgun over that any day. lol, dude thats an example. They're like 8 hit kill though... And they count as a kill if you kill them.. I'm saying should count as a kill, as they take effort to do so. I like the idea but i don't think it would work so well in game. Any good engie in TF2 would build near a metal supply so it doesn't take as long to get it up to level 3. In Combat Arms i don't think a turret will live long enough to get to level 2. This would force a spec to stay near the turret because you could just edge it and there goes 3 minutes down the drain for the spec. CA is a very fast paced game which i like and so do a lot of people, adding a turret or sentry that can actually take a players 1 v 1 would slow everything down as soon as a spec enters the game with one. I like the concept but it would change the game to much. If turrets got stronger over time (shorter then 2 minutes, they'll never survive that long), the AI for targeting was improved (no more shooting walls and it's harder to edge them), and you changed the limit to 2 and made each slightly weaker then they currently are i think this could work. If you wanted a really strong turret you would have to add a global alarm (like the airstrake has be called thing) and have a set up time for people to get over there and take it out before it's to strong thien i think that might work although there would be many balencing issues. What i was thinking when i read this topic was to go with what you said (with a shorter cool down because thats a long time and they won't survive that long) but add more then 1 type of turret. For example the current turret would stay like it has been but as it levels up only it's range and accuracy would increase, then add another turret (lets say a fire throwing turret for arguments sake) that has short range but high DPS and splash. Then a grenade turret, medium damage and medium range but has splash (same DPS as the normal turret and grenades have travel time). This would make diffrent turrets have diffrent weakneses because a single well rounded turret would be hard to kill (look at the G36E, the only reason it's so good is it can do everything from short range to long rage). If you went with my sugestion then you could make then stronger enough to be worth while without unblaencing the game. I'm open to ideas though just throwing mine out there. The Auto-Turrets could be balance by giving it a 90° view (like in TF2), increased range, decreased damage, and increased health. I find this idea really awesome. They could find a way to screw this idea up by shoving it in a corner somewhere.